This article was written in March 2016 to clear up misconceptions common in the bitcoin community at the time. 2 Myth: The number of these nodes matters and/or is too low. This number comes from sites like this and it measured by trying to connect to every nodes on their open ports. Problem is, not all nodes actually have open ports that can be probed. Either because they are behind firewalls or because their users have configured them to not listen for connections. Nobody knows exactly how many full nodes there are, since many people don't know how to forward ports behind a firewall, and bandwidth can be costly, its quite likely that the number of nodes with closed ports is at least another several thousand. Nodes with open ports are able to upload blocks to new full nodes. In all other ways they are the same as nodes with closed ports. But because open-port-nodes can be measured and closed-port-nodes cannot, some members of the bitcoin community have been mistaken into believing that open-port-nodes represent the full count. According to getaddr.bitnodes.io, there are 5834 listening full nodes. Assuming they're all using default Bitcoin Core settings, they'll each provide 117 connection slots to the network on net (125 provided minus 8 consumed). SPV nodes typically use 4 connection slots, and full nodes typically use 8. So the network can support a maximum of around 170,644 SPV nodes or 85,322 non-listening full nodes at one time. This is roughly the upper limit for the number of wallets that are online and connected to the Bitcoin network at any one time. (If there were more people online at once than that, people would start seeing various issues.) This doesn't include wallets that don't actually connect to the Bitcoin network, of course. If I look at my long-running listening full node, I currently have incoming connections from 40 full nodes and 10 SPV nodes via the Internet, and 11 full nodes via my Tor hidden service. So if I ignore the hidden service connections because they are somewhat unusual, and I assume that my node is typical otherwise, it seems reasonable to make a very rough guess that there are at this moment (40*5834)/8 = 29,170 full nodes (5834 listening) and (10*5834)/4 = 14,585 lightweight nodes connected to the network. Myth: The number of these nodes matters and/or is too low. Nodes with open ports are useful to the bitcoin network because they help bootstrap new nodes by uploading historical blocks -- they are a measure of the number of redundant copies of the blockchain available for synchronizing with. There has been no shortage of bandwidth capacity for simply syncing wallets from the available nodes, and if there were, bandwidth might be added by renting cloud servers. Full nodes are required to make bitcoin trustless. No longer do you have to trust a financial institution like a bank or paypal, you can simply run software on your own computer. To put simply, the only node that matters is the one you use. It is very much in the individual bitcoin's users rational self interest to run a full node and use it as their wallet. An example of a lightweight client happily accepting a fake transaction. If the attacker had some hashpower then this transaction could be made to have confirmations too. Running a full node as your wallet is the only way to know for sure that none of bitcoin's rules have been broken. Rules like no coins were spent not belonging to the owner, that no coins were spent twice, that no inflation happens outside of the schedule and that all the rules needed to make the system work are followed (e.g. Difficulty.) All other kinds of wallet involve trusting a third party server. If bitcoin is digital gold, then a full node wallet is your own personal goldsmith who checks for you that received payments are genuine. You wouldn't accept a cash banknote or gold coin without checking it is genuine, the same applies for bitcoin. All these checks done by full nodes also increase the security. There are many attacks possible against lightweight wallets that do not affect full node wallets. Notice how node software updated months ago was completely unaffected by the fork. All other wallets required either extra confirmations or checking that the third-party institution was running the correct version. A bitcoin business, like an exchange, marketplace or online store should always use a full node for security. Full nodes wallets are also currently the most private way to use Bitcoin, with nobody else learning which bitcoin addresses belong to you. All other lightweight wallets leak information about which addresses are yours because they must query third-party servers. The Electrum servers will know which addresses belong to you and can link them together. Despite bloom filtering, lightweight wallets based on BitcoinJ do not provide much privacy against nodes who connected directly to the wallet or wiretappers. To get the benefits of running a full node, you must use it as your wallet, preferably on hardware you control. Most people who do this do not use a full node as their wallet. Unfortunately because Bitcoin has a similar name to Bittorrent, some people believe that upload capacity is the most important thing for a healthy network. As I've explained above: bandwidth and connections are not a problem today; trust, security and privacy are. If you cannot spare the disk space to store the blockchain, you can enable pruning. Altogether this should require less than 900MB of hard disk space. If you cannot spare the bandwidth to upload blocks to other nodes, there are number of options to reduce or eliminate the bandwidth requirement. These include limiting connections, bandwidth targeting and disabling listening. There is also the option -blocksonly, where the node will not download unconfirmed transaction and only download new blocks. This more than halves the bandwidth usage at the expense of not seeing unconfirmed transactions. 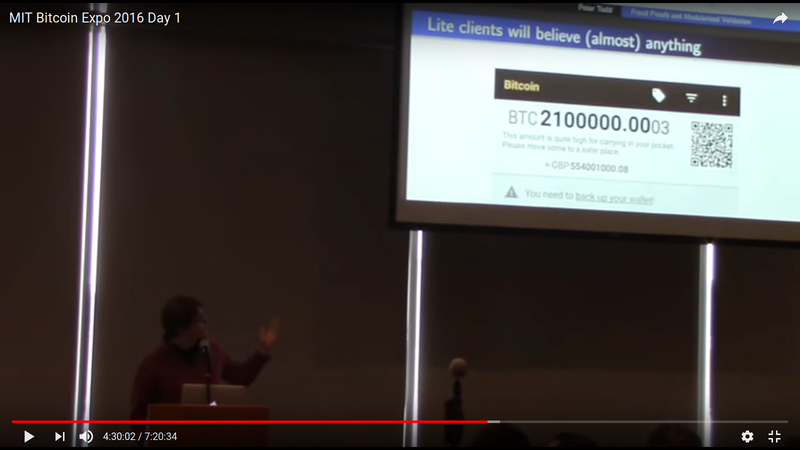 Synchronizing the blockchain for a new node has improved since 2012 too. Features like  and libsecp256k1 have greatly improved the initial synchronization time. I think every moderate user of bitcoin would benefit by running a full node and using it as their wallet. There are several ways to do this. Run a bitcoin-qt full node. Electrum Personal Server is designed specifically for this use case. So what are you waiting for? The benefits are many, the downsides are not that bad. The more people do this, the more robust and healthy the bitcoin ecosystem is. This page was last edited on 27 September 2018, at 14:16.